Dealing with landlords can be tricky. Knowing just what to say and how to say it can make all the difference. 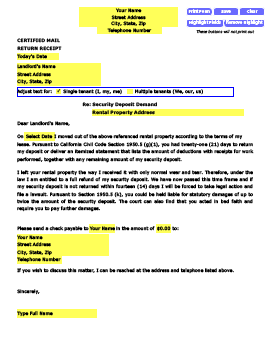 We've pre-written letters for handling all your tenant issues. All letters written by legal professionals and just $9.00. All our letters are written by legal professionals and in a simple interactive format. Just fill in the blanks and you're done. All for just $9.00. I spent an hour looking for the right letter, then I found your site. I downloaded your early lease extension letter and I was all done in about 5 minutes. And it worked! I had to write what I thought was a simple letter to my landlord. But after realizing I needed to find the right law and the exact timeframes I saw it wasn’t that easy. Hometitan’s letter saved me a lot of time. Thanks! I’ve used you guys twice now and both times I got a prompt response from my landlord. I like how the letters are just basically finished and I just needed to enter my details, just super easy to use. We want you to be able to download and be licking that sweet stamp in 5 minutes. We’d even give you a stamp too but sending electronically can be tricky. No need to fiddle and diddle with getting the writing just right. Just enter your specific details and you’re done! Apartment or home address, name, date.. you get the idea. States change their renter regulations quite often and always without much notice. Our letters are well researched to cover you with the most protection. Don’t want to buy anything today? We dig it, the Economy and what not. We have a detailed instructions page for each letter. Take it away! This is a letter from HomeTitan to you. We heard you may be having some trouble with your landlord, or your bank, or you just need an easy to use, well written letter to send to your property manager. We hear and feel your pain because we’re renters too. So we’ve got you covered. 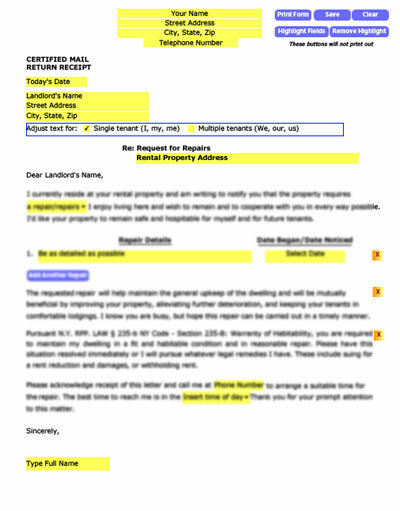 If you can’t get started on that letter yourself, you need some help on the format or verbage, or you need something just a bit more “forceful” to motivate your landlord to do the right thing, then you’ve come to the right place – built specifically for apartment renters and home renters. We try hard to provide the highest quality tenant letters. We try to make letters that really work with landlords, not the copied form letters that are passed around the Internet, each version the same with only a minor variation. And when you need a letter we just don’t have, or a variation on one we do have, then drop us an email. We’ll write a letter just for you. And for the countless others that desperately are searching on Google right now – we hear you and we’re working to make things better. This is a sample of our simple to use, interactive, letters for renters to use when they need to communicate with their landlords. There is no cutting and pasting necessary, or the need to use a text editor to adjust or add. Our letters are prepared for almost all situations and you just need to select dates, enter your details, print, and send. We’ve made them as comprehensive and easy as possible so all your renter needs can be met. Renters need to write clear and carefully in order to make sure they are within the law and to protect their rights. We’ve made it easy.